Learning to operate an OTDR properly is a critical skill for field technicians managing and servicing fiber optic networks. The OTDR is used frequently to determine length and loss characteristics, including testing optical fibers for faults and related issues that can negatively affect network performance. 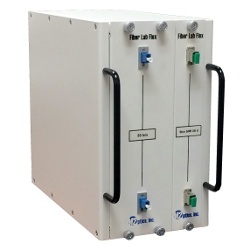 In many cases, the primary focus of a fiber network simulation platform is on the electro-optical equipment at both ends of the fiber optic link. Since the purpose of network simulators is to evaluate the DUT (Device Under Test) equipment, it only makes sense that this is where the attention will be. However, it is a crucial mistake to forget about both the stability and consistency of the test fiber because the DUT test results (performance, pass/ fail, etc) totally depend on knowing that the optical fiber characteristics are consistent and very reliable. As the use of fiber optic equipment in communications systems continues to grow worldwide, network simulation testing has become vitally important for vendors seeking to offer their equipment for use in the field.